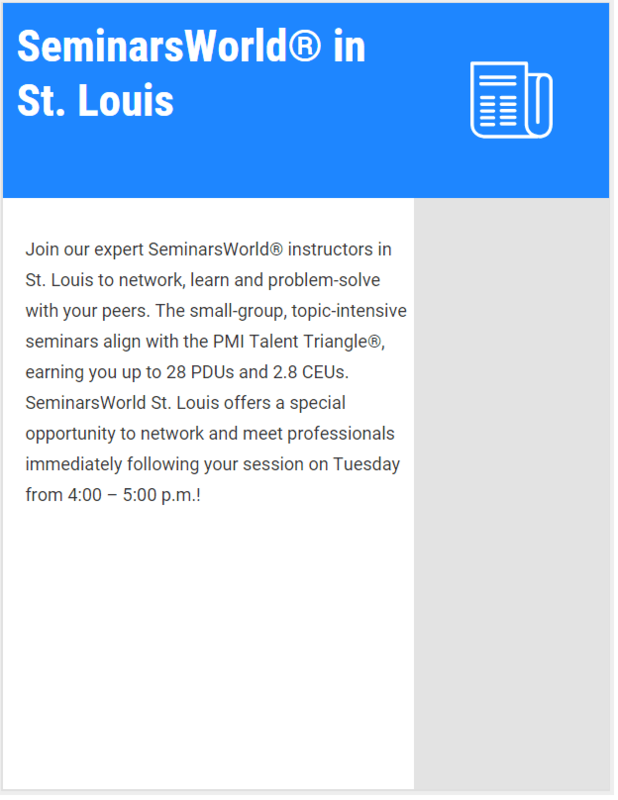 Join our expert SeminarsWorld in St Louis to network and learn with your peers in small-group, topic-intensive seminars aligned with the PMI Talent Triangle®, while you earn up to 28 PDUs and 2.8 Continuing Education Units (CEUs). Register by 13 August 2018 for early bird rates, and through 31 August, save on guest rooms at the The Westin St. Louis. Make reservations early, as rooms tend to sell out quickly. Call the hotel directly at +1 314 552 5806 or +1 800 WESTIN1 to make a reservation. Be sure to mention SeminarsWorld 2018 Room Block to receive the SeminarsWorld rate. For online reservations, click on the “book your room” button. Previous articleSeminarsWorld in Washington, D.C.